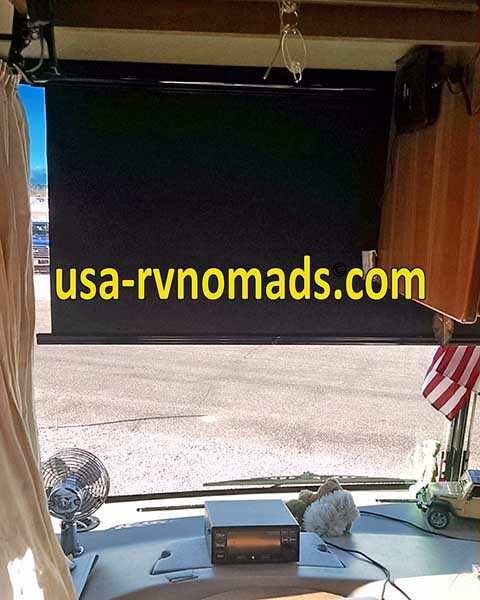 Motorhomes have windshield visors just as any other vehicle on the road. I don’t think I’ve ever had a vehicle that had the perfect sun visor setup. Our motorhome has a huge windshield and so it needs two huge visors to block the sun that beams in through all that glass. I will say they work well ... that is, they did. Quite a long time ago the driver’s side shade stopped working. With age and exposure to the direct sun beaming through all that glass, the plastic ends of the motorized visor dried out and cracked, causing it to fall on the dash ... while we were going down the road! Surprise! All I could do at the time was to take it completely off and stow it away until I could source parts or a replacement. So, I called the manufacturer, Carefree of Colorado, and guess what ... they stopped producing spare parts for the assembly. Yes, this is one of the consequences of owning an older coach. Their suggestion was to replace them with brand new units ... and this would be EXPENSIVE! I didn’t give up hope of sourcing parts to fix the ones I had. In fact, I found someone who had spare parts which I acquired at an acceptable price. We had working shades again! It turned out to be temporary though. We managed to get through a month or so and then the shade on the driver’s side started to bind up while extending and retracting. Once again, I just left it alone until I had time to tinker with it. The time arrived: This would be a great New Year’s Day project since the weather outside wasn’t conducive with doing outdoor chores. I pulled the shade assembly down and found out why it wasn’t working properly. The screws that hold the motor drive unit to the shade were loose. 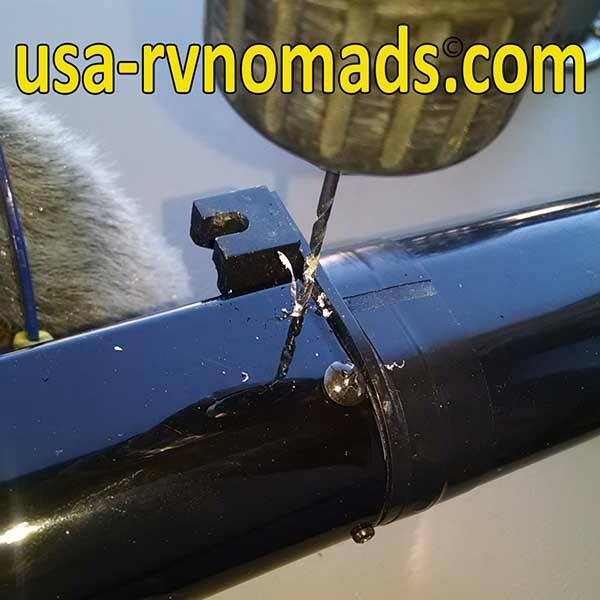 Not loose as in falling off, but when the motor was actuated to lower or raise the shade it twisted the motor housing enough to bind. Drilling a pilot hole for the screws to be installed is a necessary step. If three screws aren’t holding the motor unit in place why not add three more! That’s exactly what I did. I used some much smaller screws which were salvaged out of something electronic that was getting tossed away. I keep a selection of such hardware for times like this ... it’s just hard to not go overboard and keep too much stuff that can be repurposed. 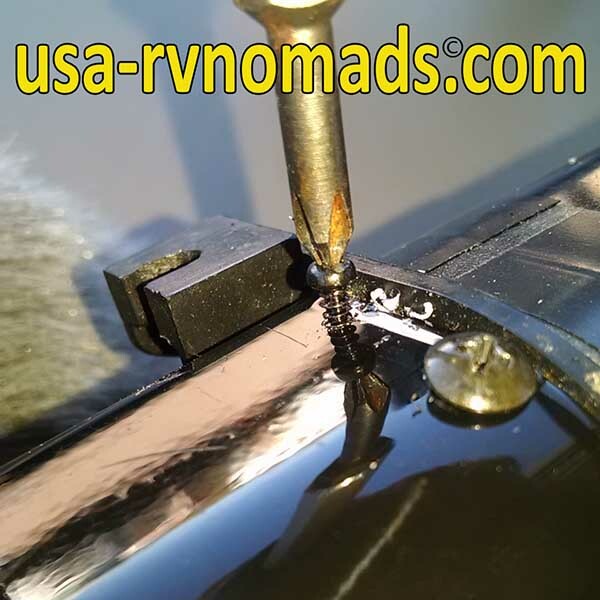 With the pilot hole drilled, its just a matter of carefully but firmly driving in the screw. I drilled pilot holes for the screws and inserted them to hold the motor unit firmly in place. It worked! The shade once again goes up and down. Not only will this help during those times while driving into the sun but also when we’re watching television. They help curb the glare from the windshield when we don’t want the front curtains closed. 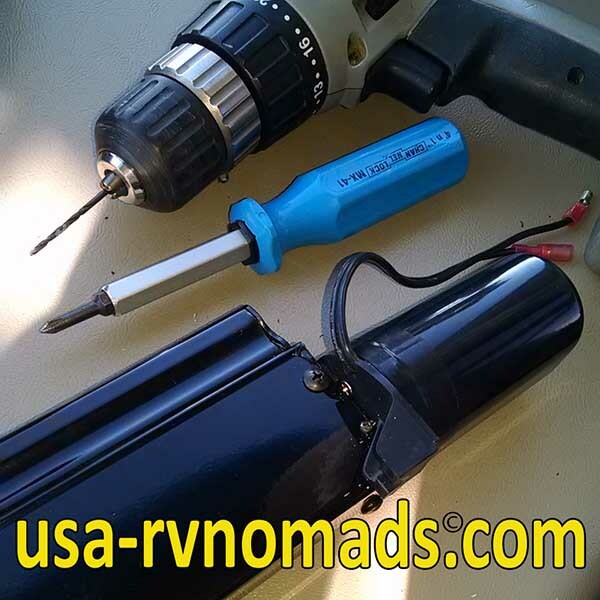 Working motorhome windshield visors ... well functioning equipment ... simple pleasures that make RVing more enjoyable.